Our engineers are experts at designing robust and reliable pumping solutions for industrial environments. This ensures all parts are capable of reliable operation in the harshest applications and installation locations. Modular design simplifies maintenance with individually replaceable, lower cost wear parts and requires no special tools. Single piece flow assembly procedures utilizing assembly fixtures and automated calibrated torque tools to validate every pump is built to quality specifications. Every pump is factory tested with an automated three point test for vacuum, leakage and run ability. Only air is used during testing to ensure no residual water is present when received. Backed by a five year warranty and outstanding after sales support. Finite Element Analysis (FEA) was used as part of the design process for maximum strength and mechanical integrity. Available in unfilled polypropylene, unfilled PVDF, 316 stainless steel and powder coated aluminum to handle the widest variety of applications. Single piece construction reduces chance of leakage. Computational Fluid Dynamics (CFD) optimized fluid path for optimum fluid velocities. Same material options as liquid chambers. Plastic pumps feature glass-fiber reinforced polypropylene (GFRPP) center section construction to decrease pump weight while providing outstanding corrosion resistance. Metal pumps offer either powder coated aluminum or GFRPP center sections to reduce weight. 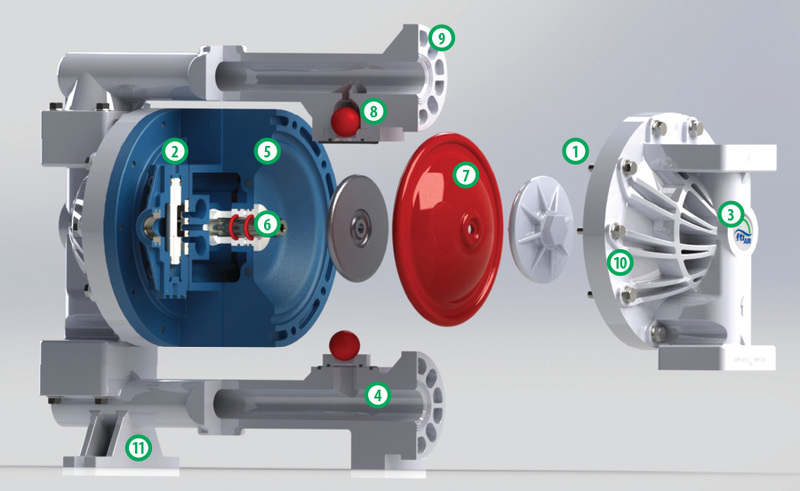 Located in the center section the shaft bushings and diaphragm shaft are an integral part of the air control system. Bushing utilizes internal seals manufactured from a proprietary TPE material with low friction and high resiliency to provide incredibly long wear life. The stainless steel diaphragm shaft moves back and forth in the bushing over these special seals. Slots in the shaft pilot the air valve. Precision manufactured diaphragms available in a variety of materials including neoprene, Buna-N, EPDM, FKM, Santoprene ™, Hytrel®, polyurethane and PTFE. Check valve balls and seats are available in a wide range of materials to provide reliable operation in a wide variety of applications. Depending upon the model, features NPT or BSP threads or universal ANSI 150/ISO-DIN PN40 flanges. 1 ½”, 2” and 3” stainless steel pumps have a 2-piece universal ANSI 150/ISO-DIN PN40 Vanstone flange option. Connection locations include end, center horizontal and center vertical. Eliminates washers simplifying maintenance and reduces the total number of parts. All fasteners are precision torqued using calibrated tools. Slotted feet with flat bottom surfaces allow for secure installation bolting.